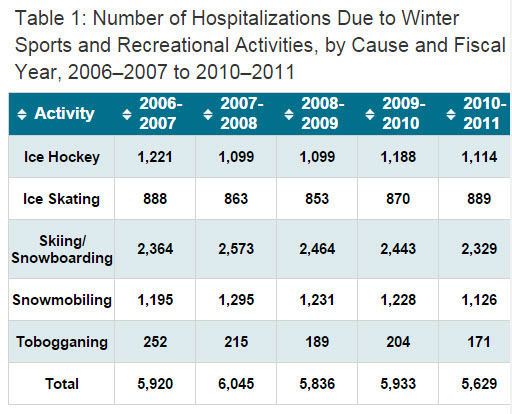 Kids: go ahead and play your video games… winter is dangerous! In researching this crazy blog… which sometimes makes me feel more like a journalist than a misunderstood geek ranting about whatever pops in my head… I have to say that this one really drove me nuts. We are going to talk a bit, well I am, about the insane banning on tobogganing in Canada and the US. Yes there are dozens and possibly hundreds by the time you read this, of cities and towns that have banned or partially banned tobogganing. There simply is not enough to do in the winter up here. If my kids are willing to dress up like Sherpas and spend the day hiking up a hill for 10 minutes for a 27 second thrill sliding back down, who am I to stop them. I warn them of the dangers and they head off. I run a scout group in my home town and Scouts Canada requires helmets on youth sledding during scout outings. I don’t mind this and I have never had a parent complain. There is still inherent risks involved and parents sign papers before such events as well. To think that tobogganing is any more dangerous that crossing the street to the hill, or driving to the store to buy a new sled is just crazy. 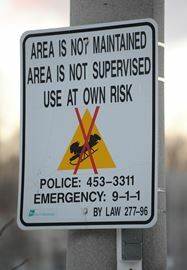 Life is all about risk management in Scouts Canada and I understand their position but why would a city the size of Calgary, AB or Hamilton, ON ban tobogganing? What do they want kids to do all winter? Skiing and snow mobiles are not cheap and you can rarely walk to these activities. Everyone has a hill nearby. So here I am getting more and more infuriated by the actions these cities are taking, and there are a lot of them, when I start to wonder, what would make a city incur all the additional costs of the “fun police”? So as crazy as this sounds, I find now that I am having a problem blaming these towns 100%. 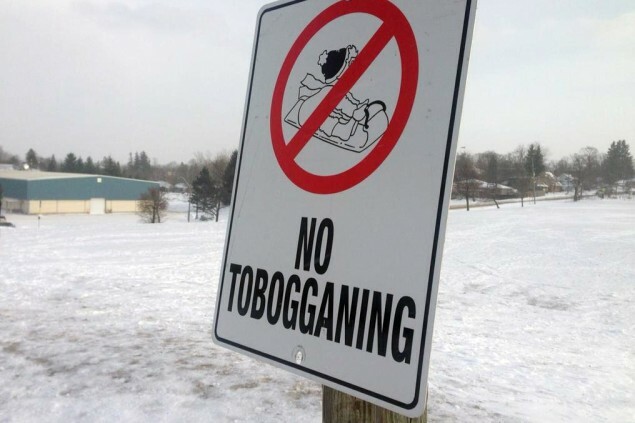 Don’t get me wrong, I think it is a little nuts that these cities believe that banning tobogganing is even something they have the right to do. On the flip side, who else could we blame? Well in the case of Hamilton, ON, where tobogganing has been illegal since 2001, they had to pay out a lawsuit which cost the city $900,000. Bruno Uggenti hit a drain pipe, on a hill that was closed, had signage, and a fence that apparently was damaged. None of these things clued in to the lawyer, who had been injured on the hill in 2004 and was previously injured in 2000 while tobogganing, and he further stated he was unaware it was even illegal in Hamilton. Wake up jackass, you’re a lawyer. It is a reported spinal injury everywhere I have seen, yet the only items I can find on his recuperation talk about months of recuperation. I was off work for almost 4 years recuperating from a car accident and got $48,000. How the hell does this idiot even have the right to sue the city for breaking the law? And how on God’s green earth does he get $900,000 for several months or recuperation? How does a city like Boone, Iowa manage to pay out $12 Million? That is roughly $1000 /person in the municipality of 12,000. I understand why they would think that closing hills is an option. City insurance coverage must be insane nowadays because of idiots making use of slack laws. I know there will be people who want to comment and tell me about the people who die each year, and there are a few. My home town of Edmonton just had a casualty on the same hill that cost them almost $1 million in 2013. Is the Edmonton Ski Club a dangerous hill? I suppose it can be. Should they shut it down and force the youth to stay indoors and play video games? Hell no. They shouldn’t even think they have the right to do something like that. On the flip side, we shouldn’t have the right to sue the city either. How stupid are our laws that we can sue a city for this let alone win? Where does it end? Someone find a way to stop the insanity. Talk to your politicians and tell them that you need the municipalities to stop being held responsible for its citizen’s stupidity. If we don’t stop it soon they will make salt and coffee illegal because it isn’t good for you. Enough government already. ← I Have to Break My Wife’s Heart and Boycott her Favorite Store! I was just watching the morning news yesterday and saw them talking about here in the US. In the Seattle area, we hardly ever get any snow so when it does snow, we are crazy dangerous with sledding. As a Dad and a Scoutmaster, I do go with my kids when they sled and make sure it is relatively safe. However, some kids aren’t supervised and I have seen some very close calls. I also can’t believe that lawyer didn’t know it was illegal! Come on! Just because you didn’t know means that it OK. You are a lawyer. I’m sorry your Canadian lawyers are becoming scum lawyers like their US counterparts.